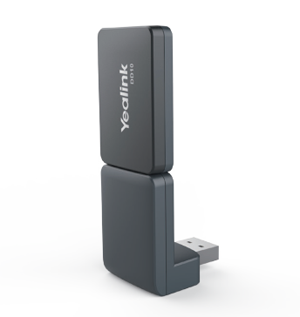 The Yealink DECT dongle DD10K not only enables T41S/T42S to work concurrently with Yealink DECT system as a handset after pairing with Yealink W60B DECT IP base station, but also enables T53/T53W/T54W/T57W/T58A/VP59 to work as a base station, which can be registered with up to 4 compatible Yealink W52H/W56H/W53H handsets. Even more, Yealink DD10K is compliant with the CAT-iq 2.0 standards, and it is easy and safe to deploy, guaranteeing a flexible and optimal user experience. • Supports Yealink SIP- T41S/T42S with FW 66.82.0.35 or 66.84.0.10, Yealink T5 series.